Kam Brooks, 19, a transgender, non-binary person, is running for Unity club president. Photo by Eli Davis. 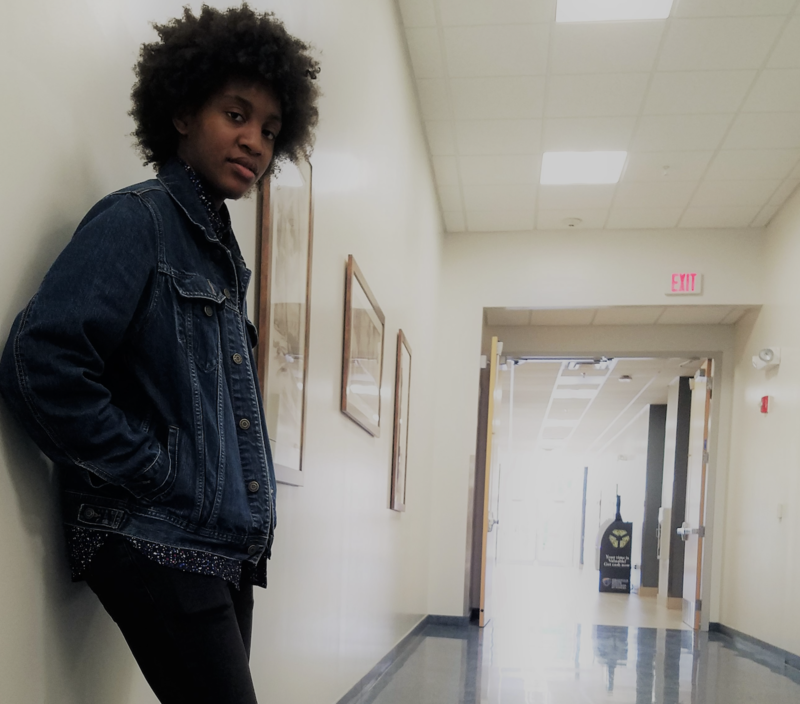 Seminole State’s Sanford/ Lake Mary Campus Unity club is hosting elections this April in which freshman Kam Brooks is running unopposed for president. Unity is Seminole State’s Gay-Straight alliance. The club president’s job is to organize events, act as the face of the group at school events, and keep meetings organized. Kam Brooks is a 19-year-old transgender, non-binary person of color who goes by they/them/their pronouns. Non-binary means that their gender identity does not fit inside of society’s set gender spectrum, this person may present themselves as “masculine,” “feminine” or “androgynous” depending on what they most feel comfortable with but outer appearance doesn’t always dictate one’s identity. When asked to elaborate on their identity, Brooks responded with “Error 404: Gender Not Found. … I’m just a person. “It’d be very interesting, I guess, to see how people interact with me or how people might see me as a form of representation if I am being the face of Unity,” Brooks said. They discussed some ideas Unity is going over recently including a “Trans: 101” to help transgender students learn to better assert their pronouns, have the confidence to come out to their professors, and how students can be better allies for their classmates. Brooks said the overall goal is to make the best impact they can on their campus. “If I can get to people who are maybe confused or curious … before they’re taught hatred and close mindedness, then I feel like I will be making a bigger impact and much safer space for a lot of kids and people who want to be more gender expressive,” Brooks explained. According to The New York Times, about 1.4 million adults in the United States identify as transgender, yet representation for these individuals is scarce and hard to come by. If Brooks continues to run for Unity president unopposed, they will win by default and be in the position to represent and effect transgender students’ lives.